I am a succor for succotash and always have been! Normally, I prepare it the “traditional” way; just corn and lima beans with milk, a little butter and salt and pepper, and a sprinkling of sugar; especially at Thanksgiving time – that’s the way Mom always made it. This is an updated, sophisticated finish to an old-time favorite from Cooking Light. Instead of 2 tablespoons butter, I coat the skillet with cooking spray and add 1 or 2 teaspoons butter, for less fat. You know the sweet/tart taste of balsamic vinegar – it’s perfect here, blending with the other ingredients. This makes a lot for a mouthwatering side dish, but it’s a great lunch in my book, packed with protein and fiber! If you like succotash too, try this new version! It’s truly delicious! Melt butter in a large skillet over medium heat. Add onion and garlic; cook 3 minutes or until onion softens, stirring occasionally. Add corn, bell pepper, basil and beans, and cook for 4 minutes. Add broth, sugar, salt and pepper. Cook 7 minutes or until liquid almost evaporates. Remove from heat and stir in vinegar. This is a delectable veggie side dish! Be sure to visit my friend, Linda’s blog @My Kind of Cooking. She is having a great cookbook giveaway now! Both of our moms made “the best” fried chicken years ago, but I probably could count on one hand all the times I’ve cooked it. And that’s mainly for the usual reasons; the messy frying and cholesterol. But, the truth of the matter may be that I never really mastered the art of frying chicken. The times I tried, it was always done on the outside, with a beautiful deep golden brown crust, and under-cooked on the inside with a greasy layer. Then I resorted to oven “fried” chicken. This is a great recipe with just the right blend of ingredients to make everyone satisfied. Sometimes, I add more garlic powder, and add Mrs. Dash Onion and Herb Seasoning. The Italian seasoned bread crumbs are perfect ~ a delicious alternative to seasonings blended with flour. Place butter in baking sheet and into oven just long enough to melt. Wash chicken and pat dry. Mix coating ingredients together in bowl. Place chicken on baking sheet. Bake for 30 minutes and turn. Bake for 20-30 additional minutes or until juices run clear and coating is crisp. Try this! It’s ‘finger lickin’ good’! We’ve had 9 consecutive days of record-high temperatures; this morning the wind chill factor is 27 degrees ~ a return to our usual Spring weather! But, even better, you adore a little coconut thrown in the mix? Splendid! A bite of this will surely put you on cloud nine! Chocolate and Cappuccino Coffee Cake is made with a kitchen staple, “Bisquick.” You know ~ that bright yellow box with the delicious looking pancakes on the front, that’s filled with baking mix. I can’t say that I use it often but, it’s good to know it’s around and handy for quickly stirring up a fresh home- baked goodie. This coffee cake from Betty Crocker is easy to make and is a great sweet treat for breakfast or as a snack later in the day! Grease square pan, 8x8x2 inches. Mix coconut, nuts, 1/4 cup sugar and 1 tablespoon butter; set aside. Beat remaining ingredients except chocolate chips and coffee in large bowl on low speed 30 seconds, scraping bowl constantly. Beat on medium speed 4 minutes, scraping bowl occasionally. Stir together chocolate and coffee; spoon over batter. Lightly swirl chocolate mixture through batter several times with knife for marbled design. Sprinkle coconut mixture evenly over top. Bake 20 to 25 minutes or until light golden brown. Be sure to visit my friend, Linda’s blog @My Kind of Cooking for great tips on Tuesday’s and good and easy recipes every Friday! A lot of recipes for mostaccioli call for 5 or 6 Italian sausage links and then tell you to remove the casing before cooking. I don’t know about anyone else, but why bother… just buy the sausage in bulk form to make the job easier. This recipe makes a lot of mostaccioli ~ note the size of the baking dish! It’s great for a small group and is perfect for a potluck; or, half would freeze well for a later meal. This is easy and delicious and gives you that satisfied feeling after eating it. Use jarred pasta sauce if you want to make it even easier. It’s delicious! Cook mostaccioli according to package directions, drain well; set aside. In a large saucepan or Dutch oven, crumble sausage. Add bell pepper and onion and cook until sausage is done. Add garlic and cook for 1 minute. Stir in tomatoes, tomato sauce and paste, mix well. Add additional ingredients up to cheese. Bring to a boil, reduce heat and simmer for 20 minutes. Coat an 11” x 16” baking dish with nonstick spray. Place half of mostaccoli mixture in baking dish. Top with half of mozzarella cheese. Spread remaining mostaccoli over all. Sprinkle remaining mozzarella on top. Cover with foil and bake at 350 degrees for 30 minutes or until heated throughout. Remove foil and bake for 5 minutes. Let stand for 5-10 minutes before serving. Try it for cheesy goodness! Be sure to visit my friend, Linda’s blog, @My Kind of Cooking for great tips and delicious easy recipes! Seriously, doesn’t hamburger pie sound just a bit strange? It sounds like a "concoction" that was served in my high school lunchroom. But, I’m crazy about hamburgers and since this includes mashed potatoes for Bill, I felt compelled to make hamburger pie the other night. It was a chilly day and this proved to be a good “stick-to-your-ribs” meal. I’m sure there are a lot of versions of this “meal-in-one” dish and I’m guessing it resembles Shepherd’s Pie. I used very lean ground beef and added mushrooms to the mix. This recipe is from my “vintage” Better Homes and Gardens cookbook. It’s a tasty, easy, hearty dish that I thought was really good and Bill thought was really great! Add potatoes to a pot of boiling salted water and cook until fork tender. Add enough milk to make them fluffy; add butter, season to taste with salt and set aside. In a large skillet, sauté ground beef, onion and garlic until meat is browned. Add mushrooms and cook until tender. Stir in green beans, soup and mushrooms; season with salt and pepper. Simmer for 2 minutes until mushrooms are tender. Pour into a greased 2-quart casserole. Spoon mashed potatoes over the beef mixture. Bake, uncovered, in a 350 degree oven for 35 to 40 minutes, until mixture is bubbly and cheese begins to brown. This chicken is tender and moist with just the right amount of sweetness, and there’s crispy skin too! I believe if you make this chicken recipe, it will be a hit with your family and friends. The chicken marinates in a mixture of lemon juice, honey, garlic, paprika and oregano that compliments the chicken perfectly and helps to tenderize the chicken. This can be thrown together quickly and is simply delicious! In a medium bowl, whisk together all ingredients, except the chicken. Place chicken breasts in a glass dish, in a single layer and add the marinade. Marinate for 30 minutes or up to 2 hours in the refrigerator, turning the chicken occasionally. Place chicken on a baking sheet and bake until cooked through and juices run clear, about 30 minutes. 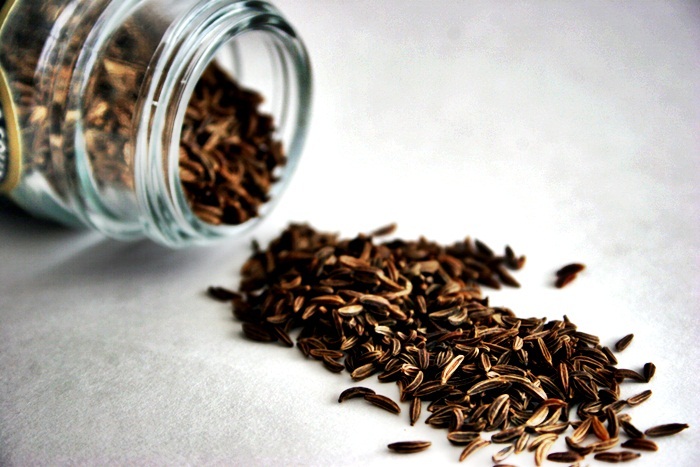 I relish the taste of caraway seeds; you know: the little brownish seeds that are in rye bread, giving it that unique flavor. The small, sort of tannish-brown, caraway seeds taste similar to anise, only milder; sweet, but a little sharp. It is said to be used in Europe longer than any other herb. I hope you try this recipe! It makes for a great dinner on these chilly evenings we’re still having! In a skillet, brown pork chops on both sides in a small amount of oil; set aside. Place cabbage in the bottom of a baking dish. Add a layer of potatoes and onions over the cabbage. In a medium bowl, whisk together the broth and flour. Add caraway seeds and stir. Place chops on top of cabbage and potatoes. Pour broth over top and cover with foil. Bake for 1 hour, remove foil to let chops brown. Bake for another 30 minutes or until chops are tender. Be sure to visit my friend, Linda’s blog, @My Kind of Cooking for great tips and delicious easy recipes. It was during the “ultimate comfort food era,” the 1950’s, when Beef Stroganoff migrated from its origin in Saint Petersburg, Russia, to the United States. Sautéed pieces of beef were served in a sauce with “smetana” or sour cream, and mushrooms. The story goes that a culinary competition was held in the 1890’s, during Czarist times, when a daring chef concocted this savory dish. The chef was employed by a high-ranking noble family, the Stroganov’s. They were wealthy beyond belief with, at one time, having 155,000 serfs on the 6.5 million acres the family owned. The creative chef named the dish in honor of his patron, Count Pavel Alexandrovich Stroganov and took away first prize. A spin on the Beef Storganoff story is that it was created specifically for the Count because he had lost his teeth and was unable to chew a steak. This version is a delicious dish that really took us by surprise. The recipe is from The New American Heart Association Cookbook. It is packed with delectable flavors and I will be making this Beef Stroganoff again!!! Discard all visible fat from meat and slice into thin strips about 2-inches long; sprinkle with pepper. Pour oil into a large skillet over medium-high heat. Cook mushrooms for 2-3 minutes, or until tender; transfer to a plate. Cook onion in same skillet for 3-4 minutes, or until brown; add to the mushrooms. Put meat in skillet and brown on all sides until rare, about 3 minutes; add to mushrooms. Put flour in skillet; gradually pour in broth, whisking constantly. Cook for 2-3 minutes, or until thickened, whisking constantly. Whisk in remaining ingredients except the sour cream. Stir in the mushroom mixture. Put sour cream in a small bowl. Stir in a small amount of meat mixture and add to the skillet. Cook for 5 minutes, or until heated through, stirring occasionally. Serve over noodles or rice. My passion is food, whether it’s cooking, eating, talking or reading about it. My blog is all about good home cooked food, with simple instructions, and no weird ingredients, with a few tales now and then. I hope you enjoy your visit here, and try the dishes that best suit your kitchen! The Best Lemon Pound Cake ~ I’m Telling You the Truth! The two biggest sellers in any bookstore are the cookbooks and the diet books. The cookbooks tell you how to prepare the food, and the diet books tell you how not to eat any of it.